"Harrington Point and Pigeon Bluff, Washington"
Click image to enlarge Grays Point and Harrington Point. 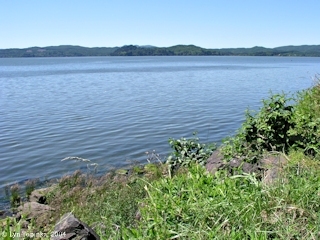 Grays Point (middle center) and Harrington Point (distance right), as seen from the Knappton site, Washington. Grays Point is the western end of Grays Bay and Harrington Point is the eastern end. Image taken April 9, 2004. 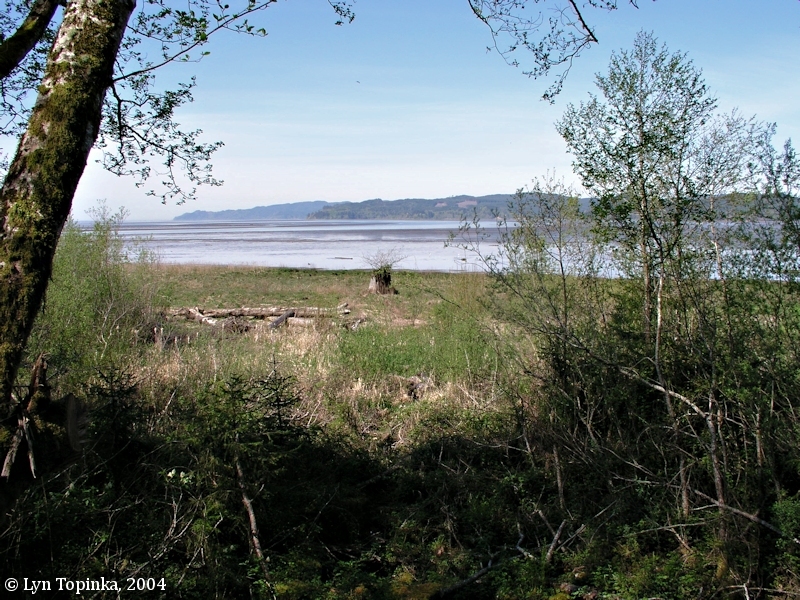 Harrington Point is the eastern point of Grays Bay and is located at Columbia River Mile (RM) 23.5. One-half mile upstream is the small community of Altoona, and further upstream is Pillar Rock. One-half mile downstream is Pigeon Bluff which lies along the curve of Harrington Point and looks into Grays Bay. Pigeon Bluff lies 1/2 mile downstream along the curve of Harrington Point and looks into Grays Bay. At one time Pigeon Bluff was known as "Yellow Bluffs". 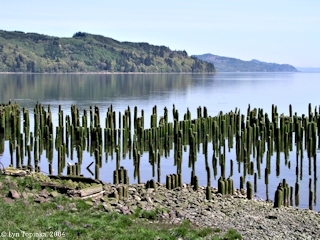 In reality the men were really looking at the lower Columbia River estuary and Grays Bay, with another 20 miles to go before reaching the Pacific Ocean. Today a turnout at Pigeon Bluff along the road to Altoona and Pillar Rock contains a viewpoint overlooking Grays Bay, and an information kiosk honoring Clark's "Ocian in view! O! the joy". 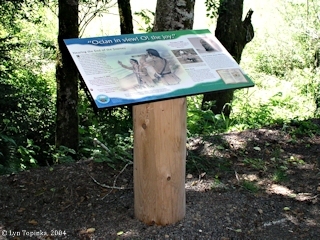 Click image to enlarge "Ocian in view". From the road to Pillar Rock, near Pigeon Bluff (Mile Post 5). Image taken June 16, 2004. Click image to enlarge Grays Bay, Washington. From the road to Pillar Rock, near Pigeon Bluff (Mile Post 5). Image taken April 9, 2004. 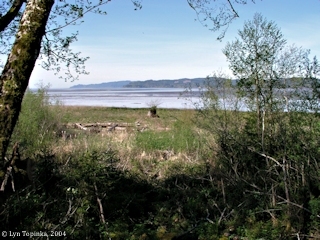 Click image to enlarge Grays Bay, Washington, high tide. From the road to Pillar Rock, near Pigeon Bluff (Mile Post 5). Image taken June 16, 2004. 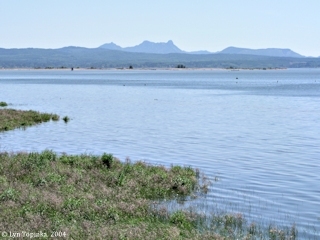 Click image to enlarge Saddle Mountain, Oregon, as seen from Grays Bay, Washington. From road to Pillar Rock between Pigeon Bluff and Harrington Point. Image taken June 16, 2004. 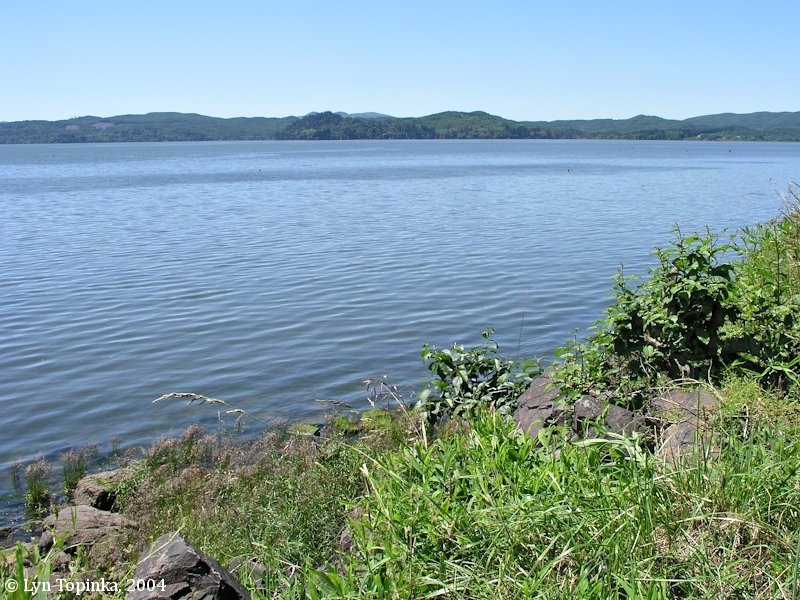 Lieutenant William Broughton of Captain George Vancouver's Expedition, passed Harrington Point on October 25, 1792, on his way upstream in his exploration of the Columbia River. 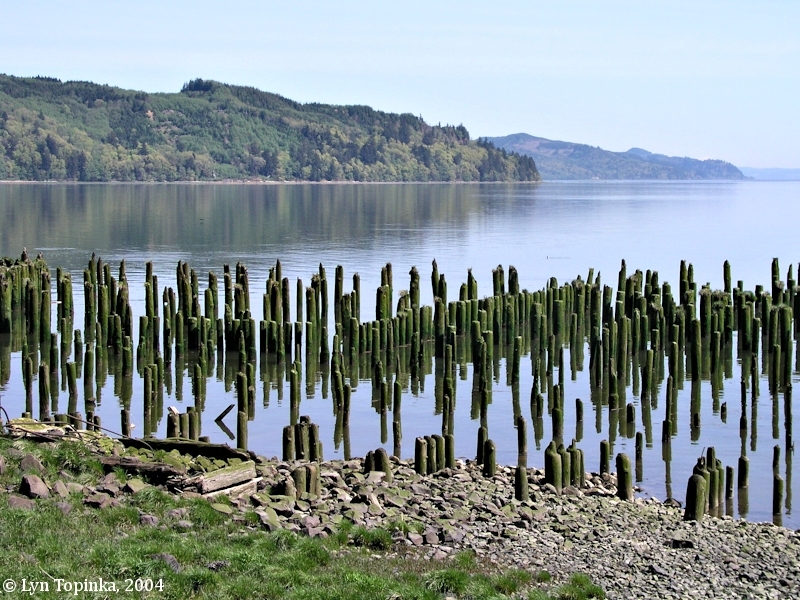 In 1841, Harrington Point is labeled "Rock Point" on the map "Sheet No.2, Columbia River from Astoria to Katalamet Head", made by Charles Wilkes of the U.S. Exploring Expedition. The bluff above "Rock Point" is labeled "Red Bluff". Pigeon Bluff is labeled "Yellow Bluff". The 1875 U.S. Coast and Geodetic Survey's Chart #641, "Columbia River Sheet No.2", has only "Yellow Bluffs" labeled, the area of today's Pigeon Bluff. An 1887 U.S. Army Corps of Engineers Map, "The Columbia River from Celilo to the mouth showing locations of the salmon fisheries, 1887", has "Yellow Bluff" labeled. The 1890 U.S. Coast and Geodetic Survey's Chart #6141, "Columbia River Sheet No.2", also has only "Yellow Bluffs" labeled. "... Gray's Point -- This is the moderately high wooded point on the north side of the river three and five-eighths miles north twenty-eight degrees west (N. 28o W.) from Tongue Point. It lies four and seven-eighths miles north forty-five degrees east (N. 45o E.) from Point Ellice. There is as much as ten fathoms of water immediately under the point, but there is no deep channel to the east or to the west. Yellow Bluffs lie four miles north seventy-three degrees east (N. 73o E.) from this point, and between them lies Gray's Bay. ..."
"... Yellow Bluffs. -- This is the rounding and rocky southwest face of Flat Hill, a great basaltic mass rising abruptly from the river and reaching an elevation of thirteen hundred feet in five-eighths of a mile. 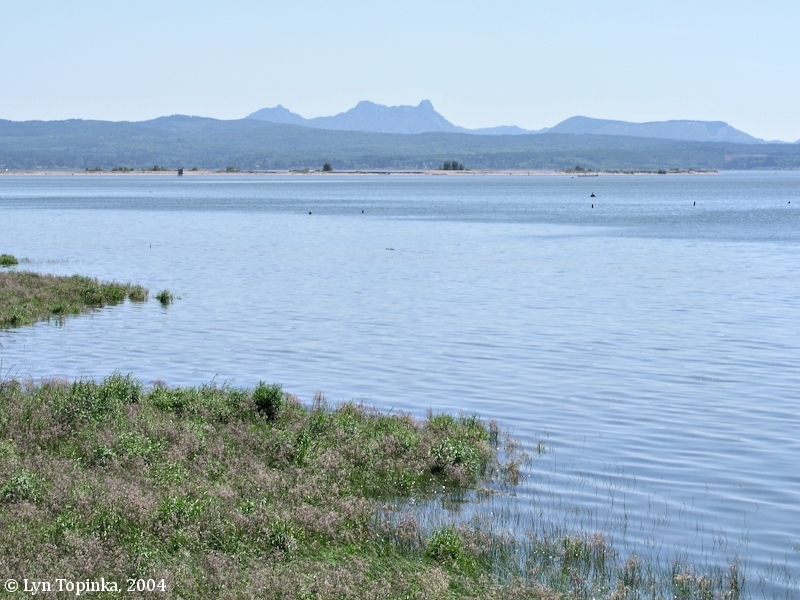 There is shoal water on the west side of the point, but a deep channel under the south face of Flat Hill. Yellow Bluffs and the comparatively low but wooded shore to the northward to Gray's River form the eastern boundary of Gray's Bay. Under the southern face of Flatt Hill, where the deep channel is close to the shore, a stake light has been placed about one and one-tenth miles eastward of Yellow Bluffs. It shows a white light, and is one of the numerous lights up the river. The characteristics of these lights are given in the annual list of the Light-House Board. It is eight miles from Astoria. ..."
A Cloudy morning Some rain, we did not Set out untill 9 oClock [from their campsite near Pillar Rock], haveing Changed our Clothing- proceeded on Close under the Stard. Side, the hills high with Steep assent, Shore boald and rockey Several low Islands [islands of the Lewis and Clark National Wildlife Refuge] in a Deep bend or Bay to the Lard Side [Cathlamet Bay], river about 5 or 7 miles wide. three Indians in a Canoe overtook us, with Salmon to Sell, passed 2 old villages on the Stard. Side [passing Altoona] and at 3 miles entered a nitch [Grays Bay. Harrington Point and Pigeon Bluff are the eastern end of Grays Bay where the explorers would first spot the Bay.] of about 6 miles wide and 5 miles deep with Several Creeks [Grays River, Deep River] makeing into the Stard Hills, this nitch [Grays Bay] we found verry Shallow water and Call it the Shallow <nitch> [Grays Bay] we came too at the remains of an old village at the bottom of this nitch and dined [Miller Point], here we Saw great numbers of fowl, Sent out 2 men and they killed a Goose and two Canves back Ducks here we found great numbers of flees which we treated with the greatest caution and distance; after Diner the Indians left us and we took the advantage of a returning tide and proceeded on to the Second point [Portuguese Point, just east of Grays Point, the first point being Rocky Point] on the Std. here we found the Swells or waves So high that we thought it imprudent to proceed; we landed unloaded and drew up our Canoes. Some rain all day at intervales; we are all wet and disagreeable, as we have been for Several days past, and our present Situation a verry disagreeable one in as much; as we have not leavel land Sufficient for an encampment and for our baggage to lie Cleare of the tide, the High hills jutting in So Close and Steep that we cannot retreat back, and the water of the river too Salt to be used, added to this the waves are increasing to Such a hight that we cannot move from this place, in this Situation we are compelled to form our Camp between the hite of the Ebb and flood tides, and rase our baggage on logs- We are not certain as yet if the whites people who trade with those people or from whome they precure ther goods are Stationary at the mouth, or visit this quarter at Stated times for the purpose of trafick &c. I believe the latter to be the most probable conjucture- The Seas roled and tossed the Canoes in Such a manner this evening that Several of our party were Sea Sick.